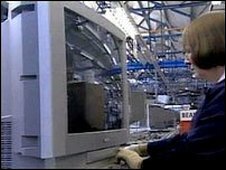 A television monitor manufacturer which is to shut its Suffolk factory with the loss of 60 jobs has blamed the economic downturn and "price competitiveness". Sanyo Industries, based in Lowestoft since 1982, plans to stop manufacturing by the end of next month. A spokesman said: "The current economic situation and price competitiveness have resulted in insufficient orders for the company to remain viable." Help will be given to help its "highly skilled" staff find new jobs, he said. The company moved out of domestic television production in 2006 and brought out new products, including all-weather televisions for hazardous environments. The company also upgraded its manufacturing technology, while cutting its workforce in Lowestoft from 350 people to 60. The remaining staff, mostly recruited from north Suffolk and south Norfolk, are long-serving employees. "For the last 18 months there has been a considerable slowdown in demand due to the increasing financial restriction which has also affected the consumer retail markets," the spokesman said. "We deeply regret the proposal to stop production at Lowestoft, which was only taken as a last resort. "There appears to be no realistic prospect of an upturn in commercial business for at least the next two years."